A "large black bear" has killed a 16-year-old boy who was participating in a popular trail running race in Alaska on Sunday, police say. Patrick Cooper of Anchorage texted his family to say he was being chased by a bear while descending the extremely steep terrain. The race director, who had been handing out awards, organised a search party of runners after he was shown the message. 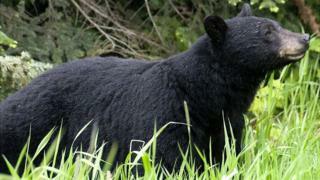 Officials shot the bear in the face, but it survived and ran off. "It did definitely take a slug strike to the face when the ranger fired on it," said Tom Crockett, a park ranger with Chugach State Park, near to the city of Anchorage. "We know he struck it," he added. Wildlife and law enforcement officials are still searching for the bear, which they intend to kill if found. Patrick was running in the juniors' division of the 29th annual Robert Spurr Memorial Hill Climb race between Anchorage and Girdwood, the Alaska Dispatch News reported. He reached the halfway point - about 1.5 miles from the start - and texted his mother at 12:37 local time after turning back. Race director Brad Precosky mobilised runners to head back up the trail in search of the boy after a runner returned shouting about a bear attack. The searchers, who were unarmed, discovered the boy's remains about 500 yards from the trail. The 250lb (113kg)-bear was nearby, according to local reports. Patrick's remains were airlifted from the scene. "I've been running in the mountains for 30 years," Mr Precosky told KTUU News, adding that there were multiple sightings that day of black and brown bears. "People come down off the trail and say they've run into a bear. Sometimes that means nothing; other times, it's really serious. Like this."